The Man in Black. In a career that spanned almost five decades, Johnny Cash gave us more than 100 records and dozens of hit singles. And he did it all with the simple, powerful honesty that would become his trademark. Inspired by Cashs trusty Victor Capo, this Capo in Black is rugged and durable, with a solid, cast-bronze construction for increased mass and sustain. Its precise wormgear adjustment provides even pressure across your strings for excellent tuning stability and easy repositioning. 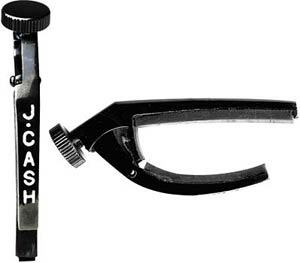 The Cash Capo: Tough. Honest. Classic.